This is the story of a cake that most people won't make. 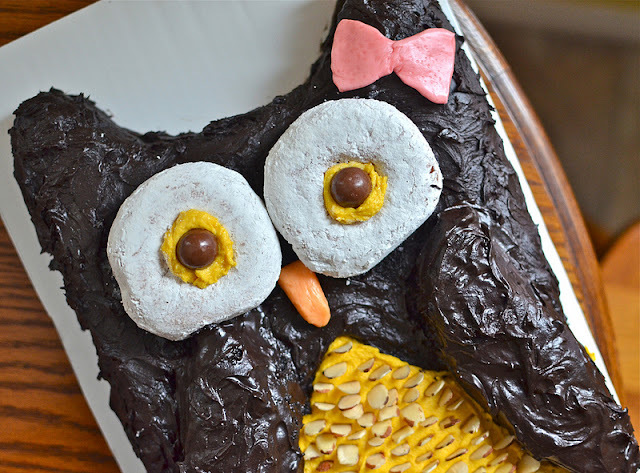 But, if you do make it, here is the story of how to make a darling and delicious owl-shaped cake even if you're not a Better Homes & Gardens professional. Now, I made almost everything homemade for this cake (except for the donuts and other decorations). I don't think making the cake & frosting necessarily made it more challenging, but I think you could probably cut some time by using a boxed cake mix, a can of chocolate frosting, and some white canned icing mixed with food dye. I made this with my favorite cake and frosting recipes, but you can see the original Better Homes & Gardens recipe via the link below for their how-to and their frosting recipes if you don't like mine. 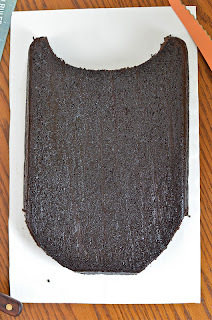 However you make this cake, I highly recommend allowing plenty of time and patience to freeze your 13x9 cake: you will find it so much easier to cut and work with if you do. Freezing it doesn't preclude you from having any issues with the cake falling apart, but, in my experience, I find freezing any cake recipe makes it easier to trim and slice. If your cake does fall apart, just try to use some frosting to cover it up. If it turns out a little weird looking, like the left wing did on my cake, just tell yourself that that little bit of the "homemade touch" is endearing, and, when you ship the cake off to be served, your grandmother and one-year-old cousin will not even be able to tell the difference (more on that later). Speaking of assembling the cake, above is the diagram for how to assemble the cake. You can see that the wings are cut from the semicircle cut out to form the head and ears. Also, you can see that my owl is a little lopsided at the bottom: that homemade touch showing. I think I would recommend you use a circular object to trace those bottom edges out so that you get them nice and equal. 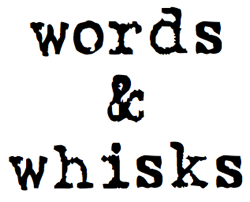 A few more notes while I've got your attention (before I get to anecdotal type of parts most people don't read, of course): leave yourself plenty of time to stick those sliced almond "feathers" into the owl's yellow belly. Start from the bottom and work your way towards the head with those. Whew. 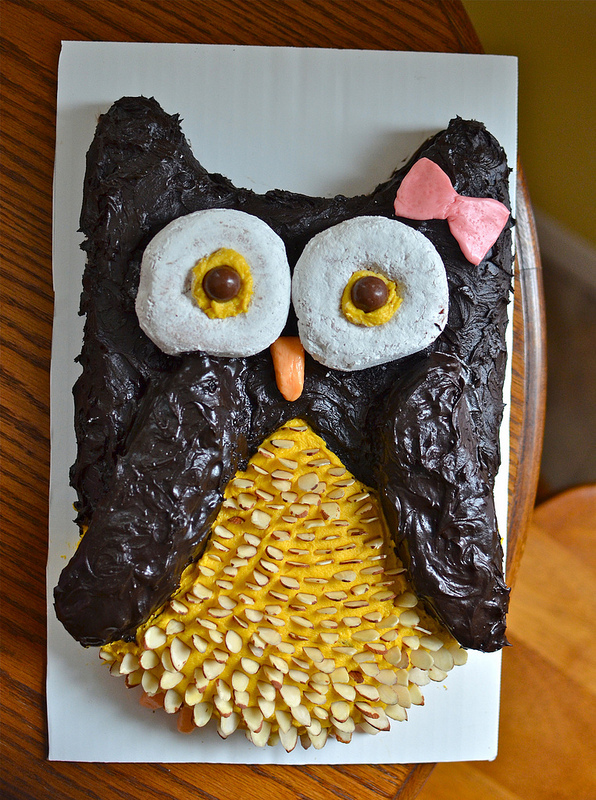 Now that I've gotten all those little notes-that-didn't-quite-fit-anywhere in, let me tell you about how this owl cake came to be! This post is a while coming: I made this owl cake the week before Easter for my youngest cousin's first birthday; my cousin Maggie is adorable, by the way. My mom and my 10-year-old sister Mia were going to Cincinnati that week to visit my grandparents because it was Mia's spring break. Of course, the pair of them was also making plans to attend Maggie's birthday party (my aunt, uncle, and their children live in the same town as my grandparents). And, by making plans, I mean plotting cakes. You know how there's that cute food blog have cake, will travel? Well, that seems to sum up my mother, my sisters, and me. We brought a pumpkin dump cake and a fire truck cake out to Cincinnati for to my cousin's 3rd birthday party after New Year's. One summer, Steph and Hannah brought made a few beautiful "wedding" cakes for my grandmother's birthday party, also out in Cincinnati. Essentially, if you invite one of us to your birthday party--near or far--we will do our best to bring cake. So, after much back and forth, my mother and I decided on this cake: easily transportable and a pretty foolproof assembly. I dug up my favorite cake & frosting recipes and set to work (after multiple trips to the grocery store...). Unfortunately, the day that I made the cake, there was a horrible snowstorm--snowing so hard that the weather people said you weren't supposed to go anywhere. But, I needed to get that cake to my parents' so my mom and Mia could take it with them. Since Smart car wouldn't have made it out of my garage (even an inch of snow is too tall for it to handle! ), I did my best please, this is life or death plea to Nick, so he drove me + the cake over in his car (okay, I really didn't have to beg him, but I thought it would add a little drama to the story). We risked our lives (that is, Nick drove slowly, and we only had one incident of slipping and sliding on the road), but we finally got that cake delivered. chocolate cake adapted from here. Add the sour cream and vegetable oil to the dry ingredients and mix until combined. Slowly pour in the coffee a little at a time, stirring until a smooth mixture forms. After the coffee and other ingredients are smoothly combined, stir in the vinegar and vanilla. 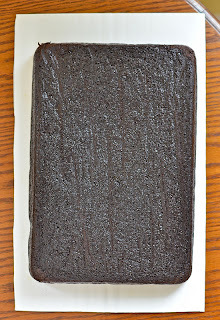 Pour the batter in the prepared cake pan and bake at 350 degrees F for about 35 to 40 minutes, or until a cake tester or toothpick comes out clean. I have neither toothpicks or cake testers on hand, so I always use a very sharp knife to test my cakes. When the cake is finished, let it cool in its pan briefly. As you remove it from the pan, remove the parchment paper and set it with the top side down onto a sheet or board that will fit in your freezer. Before slicing it up into the owl, let the cake sit in the freezer for a while; you'll find working with it will be much easier. peanut butter cream cheese frosting adapted from here (half the recipe). With a hand- or stand-mixer, beat together the softened cream cheese and the butter until smooth. Slowly beat in the powdered sugar, one cup at a time. When the frosting is smooth, beat in the peanut butter. When everything has been smoothly combined, slowly beat in yellow gel food dye (I use Wilton's) until the desired yellow color for frosting the owl's belly is achieved. dark chocolate decadence frosting adapted from here (one-and-a-half times the recipe). In a large bowl, use a hand- or stand-mixer to beat butter until fluffy and smooth. Slowly add in cocoa powder; then, add the milk & vanilla. Slowly add in powdered sugar, beating until a smooth, spreadable frosting is formed. ideas & technique adapted from BHG. To assemble the owl, first lay cake vertically on a cardboard cake board or on a rectangular serving platter (see instructions for cake). Using a serrated knife, perform the following cuts to form the body and the wings of the owl (see pictures above for a better description). To carve out the body, make two rounded cuts at the bottom of the owl. Next, carve out the head. Be careful with this part, as it will also be used for the wings. 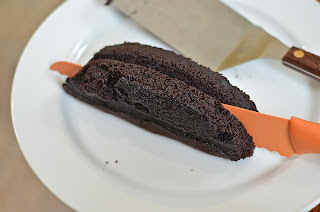 Carve out a shallow crescent from the top of the cake. Remove the crescent carefully and slice it in half along its height-dimension in order to form the wings. 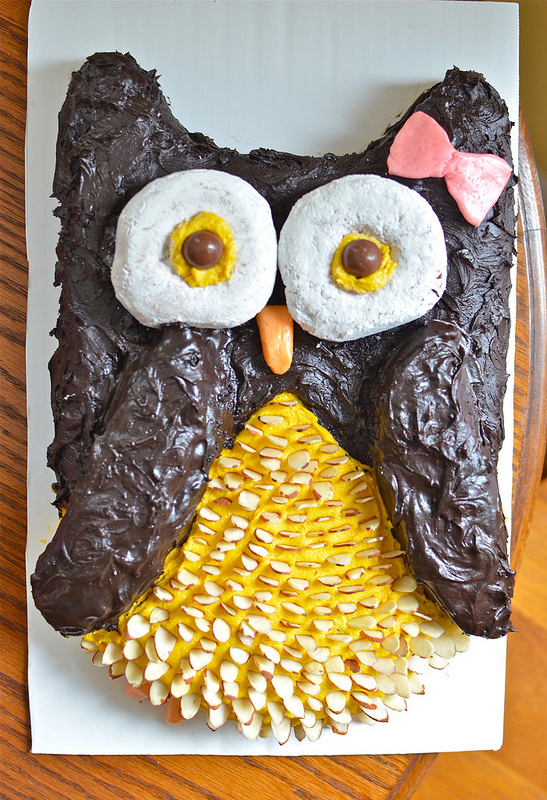 Using a little chocolate frosting, attach the wings of the owl, flat-side out, to the top of the cake. Position them at a slight angle. 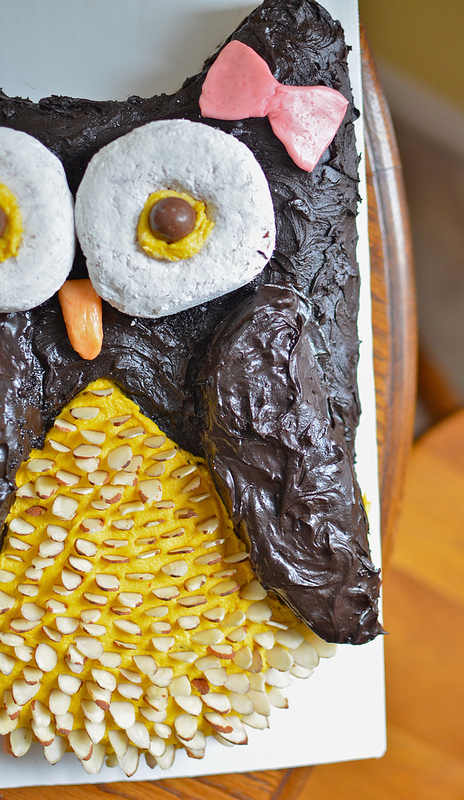 Now, frost the wedge-shaped belly portion of the owl with the yellow peanut butter frosting. Be generous here, as you will be sticking sliced almonds in the frosting. Next, frost the rest of the body with the chocolate frosting. 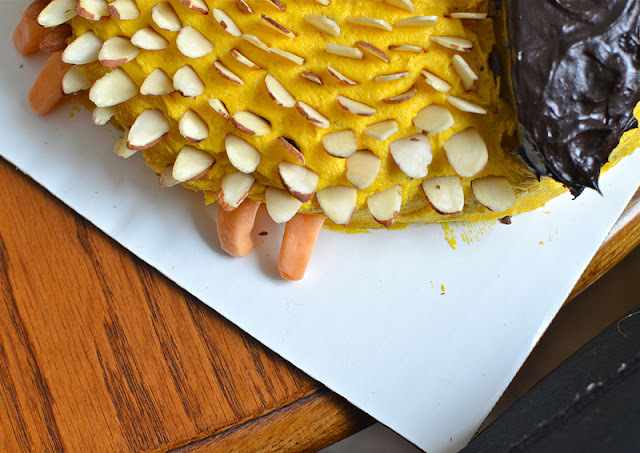 Use a small knife to get the chocolate frosting right up to the border of the yellow frosting. Be generous here, too, especially if you want a feathered effect. I created my feathered effect by running a small spoon in circles over the frosting after I'd spread it on the cake. 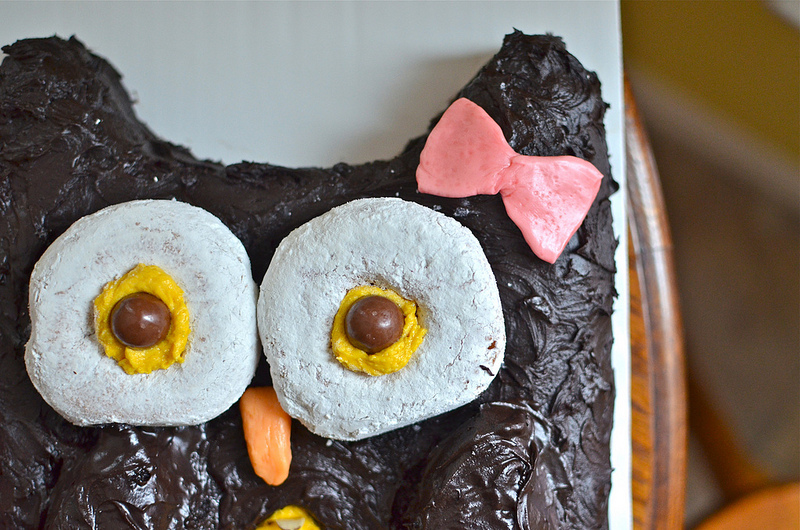 When you're happy with the frosting, stick your donuts on the owl, right above the wings. Using a little dollop of yellow frosting, attach the malted milk ball eye balls in the middle of the donuts. Next, insert the rows of slivered almonds into the yellow-peanut butter belly frosting. I'd recommend starting from the bottom here and working your way up. To make the claws and the bow, you will use orange and pink starbursts, respectively. I used one orange starburst for the nose and half an orange starburst for each claw (I sliced them in half before softening them). I softened them to make them easy to mold by sticking them on parchment paper (NOT a plate) and microwaving them for about 5 seconds at a time (any more than this and you will melt them!). I used two pink starbursts and molded them together in a similar way for the bow. Attach the claws at the bottom of the owl and the nose right in between the doughnuts. For the perfect finishing touch, attach the bow right on one of the owl's "ears." Refrigerate or freeze until ready to serve! Thank you! She's just cute! P.S. I added your blog to my google reader, and I've really been enjoying it! The fact that you are in Autumnal sweaters right now is funny considering we're in full-on Spring!